A lot of these are yes/no options, and in any of these, it will give a little more information about the number (showing the calculation to show why it is or is not that type of number). For the base conversion, when you get to base 11 and upwards, it uses the convention of using the letters to represent numbers (for example 11 is a, 12 is b, and so on). Above 36, there is a different system for this. Can you find the next perfect number? What about the third perfect number? Which numbers have an odd number of factors? Why is this? Which numbers have only 2 factors? Why is this? Can you find two numbers with the same prime decomposition? Type the number for which you want to see its properties. There is no upper limit on the size of the number. Anything below 12 digits will be calculated almost immediately, bigger than this, and you may need to wait for the calculations to happen. If you are unsure what a particular property means, hover over the word for a brief description, or click the word to link to a more detailed description on an external page. Work on factors is a rich area for displays. 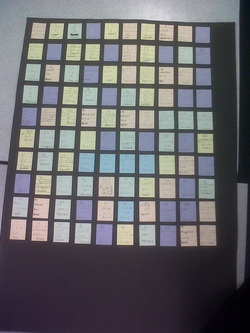 Get the students to create a small card (no bigger than a business card) for each number from one to 100. On each card list all the factors, write down the prime decomposition, and work out whether the number is perfect, abundant or deficient. Splitting them in to 4 groups, and giving 25 cards to each group splits the work, and if you ensure somebody in the group is checking every card (maybe using the QuickQuestions Interface ©) then you should have a nice display, that can also serve as a reminder. This can then be extended in to highest common factors. Looking for patterns arising in the number of factors for each number can help secure an understanding of primes (and also look into square numbers). A discussion of how rare perfect numbers are could also follow, with a brief discussion of them at Wolfram Maths.